The painting “The Philosopher Illuminated by the Moon and the Defective Sun” was painted in oil on canvas in 1939. Pictures of Salvador Dali 1938-1949 refers to the period of his life and creativity, called the “American Dream”. In these years, the author was in America, along with his wife Gala, who, divorced in 1934 with her previous husband, was finally able to become Dali’s wife. The period of life in America became very productive for the artist. He manifested himself in all branches of creativity, from paintings to the production of his own newspaper. His productivity and persistence at that moment of life would envy many. Dali liked America. She satisfied him that the Americans, at that time, were open to everything new that gave Dali the opportunity, if not to be understood, at least not to fall into the ranks of those convicted for not fitting into the generally accepted framework. Misunderstanding angered and pursued him in Europe, so America was inexpressibly happy. One incident in America brought Dali unprecedented fame and drew many admirers to his work. The management of the department store in New York ordered El Salvador the design of storefronts. The artist, of course, did everything in the first category and in his extravagant style. As a result, in the window of the department store there was a black satin bath, over which was hung the head of a buffalo with a bloody dove in its teeth. This composition has gathered a whole crowd, wanting to look and, that day, on Fifth Avenue it was impossible to pass. The management of the department store closed the exposition, which did not anger Dali. He took a bath in his hand and threw it out the window through which he went and was arrested by the police. This case attracted a lot of attention to the personality of Dali, so the exhibition in the New York gallery, which was later held by the artist, was a huge success. 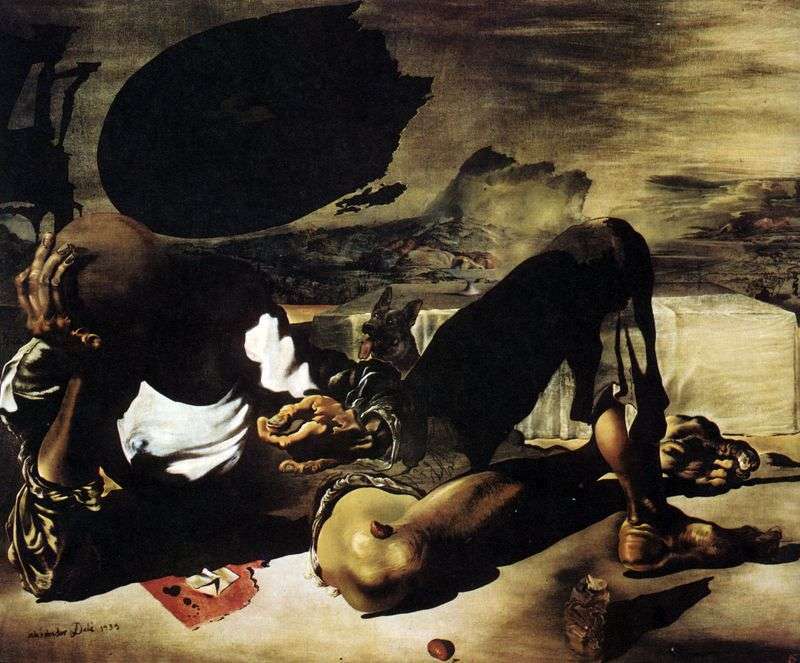 Description and meaning of the painting A philosopher illuminated by the moon and a defective sun by Salvador Dali.